America's favorite sporting event is about to get reacquainted with America's Favorite Ketchup. Heinz Ketchup will return to the Super Bowl on Feb. 2 with a 30-second commercial from Cramer-Krasselt in Chicago—its second time in the big game and its first since 1998. The spot will "highlight the belief that when someone picks up a bottle of Heinz Ketchup, they're triggering all the happy memories they've experienced over the years where Heinz was present," the brand said in a statement. No other creative details were available. 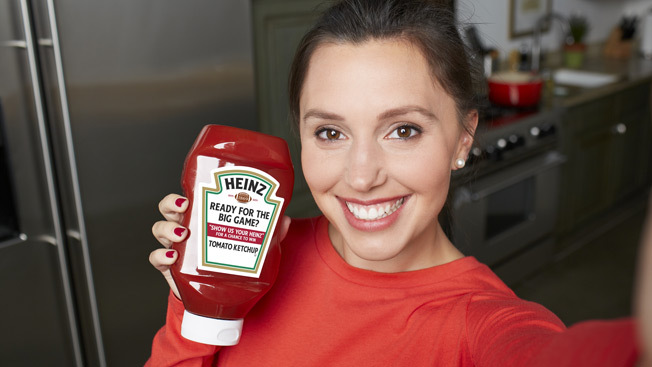 The ad is part of a larger "Show Us Your Heinz" campaign that encourages consumers to send in photos of themselves with Heinz products. Through Feb. 23, specially marked ketchup bottles will have a QR code on the back that links to the campaign page. More than $400,000 in prizes will include five grand-prize trips to five major sporting events over the next year. "Heinz's participation in the Super Bowl is an opportunity to remind consumers of the love they have for this iconic brand," said Bill Ulrick, senior brand manager for Heinz North America. "The commercial investment is part of a larger effort to renew our commitment to engage with our great fans."